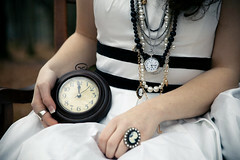 Time is a concept that can be difficult to grasp. With preschoolers, I tend to focus on seasons of the year and daily occurring events (breakfast, playtime, bath time, bedtime to name a few). Here are a few songs that go along with the general idea of time. Some are for singing; some are for movement & playing activities. Others are for discussion. Listen & Learn Music – Rachel Rambach has some very affordable music songs about seasons and months to check out. Do you have other songs or books you use when talking about time with toddlers & preschoolers? Please share them under comments!